Description: This is a 10-piece Pick-Up & Peek Puzzle. The 10 hardwood pieces fit into a hardwood tray. Most of the pieces have a small yellow plastic knob on them that allows child to lift the piece from it's place on the tray. Another picture is hidden under the puzzle piece, and is revealed when child picks the piece up. The completed puzzle has a picture of a white horse with a gray colt inside of a barn. This puzzle is very rare. FPT2303 - Rectangular pressed wood puzzle board with recessed areas to place puzzle pieces. 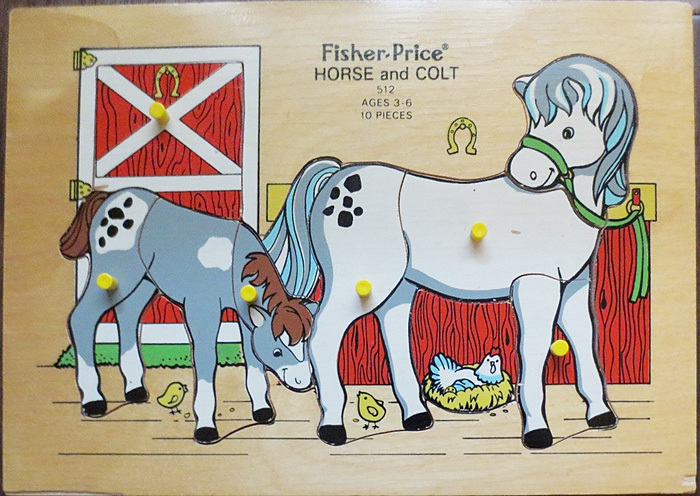 The puzzle board is marked "Fisher-Price, HORSE and COLT, 512, AGES 3-6, 10 PIECES" in the top center with a picture of a horse shoe to the bottom right. FPT2540 - Red top half of a barn door with a white edge, white X in the center, a yellow horseshoe near the top, and has a small round yellow plastic upright peg in the center of the puzzle piece. FPT2541 - Grey colt's head with a brown mane and a small round yellow plastic upright peg in the center of the puzzle piece. FPT2542 - Grey colt body with one front leg. FPT2543 - Grey colt hip with back two legs. The hip has black spots and the back has a brown tail. Has a small round yellow plastic upright peg in the center of the puzzle piece. FPT2544 - Large white mama horse body to neck. Has a small round yellow plastic upright peg in the center of the puzzle piece. FPT2545 - White mama horse two front legs with black hooves. Has a small round yellow plastic upright peg in the center of the puzzle piece. FPT2546 - White mama horse head with a grey name and a blue harness around her snout. FPT19832 - White mama horse hip and back legs. The hip has black spots and the legs have black hooves. The legs have a small yellow chick between them. Has a small round yellow plastic upright peg in the center of the puzzle piece. FPT2547 - White chicken sitting in a round yellow nest. FPT2548 - Brown wood-simulated stable divider wall piece. FPT8080 - Mint (unopened) puzzle set. Measures 13-1/2" wide, 11-1/3" high, and 7/8" thick. FP512BOX1972 (Box ONLY) Sold in display box that measures 13-1/2" wide, 11-1/3" high and 7/8" thick. FP512SET1972 - (Complete Set) Complete puzzle set.